This Hubble Space Telescope image of Vesta shows another of the most massive asteroids in the asteroid belt, a region between Mars and Jupiter. The images are helping astronomers plan for the Dawn spacecraft's tour of these hefty asteroids. NASAhas begun the countdown for its Dawn spacecraft's encounter with the giantasteroid Vesta, slated for less than a year from now. Beginning next July, Dawn will orbit Vestafor a year, conducting a detailed study and becoming the first spacecraft everto orbit a body in the asteroid belt. Previousmissions have shown us a handful of asteroids, but Vesta will be special,scientists say. "Vesta is going to amaze us," saidMarc Rayman, Dawn's chief engineer at NASA's Jet Propulsion Laboratory. 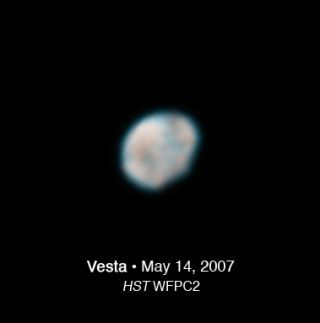 At 350 miles (565 km) across, Vesta is nearlya world unto itself. It's the second-largest body in the asteroid belt,containing almost 10 percent of the entire belt's mass. The asteroid Ceres, solarge it is considered a dwarf planet, is the only belt object bigger than Vesta. "It's a big, rocky, terrestrial-typebody ? more likely similar to the moon and Mercury than to the little chips ofrocks we've flown by in the past," Rayman said of Vesta. "Forexample, there's a large crater at Vesta's south pole, and inside the crater isa mountain bigger than asteroid Eros." Researchers hope Dawn's mission will helpthem understand how planets form. Astronomers think, after all, that Vesta wasin the process of becoming a full-fledged planet when Jupiter interrupted itsgrowth. The gas giant's gravity stirred up the material in the asteroid belt soobjects there could no longer coalesce. Dawn, which recently set a record for the all-timebiggest speed boost for a spacecraft engine, will start its Vesta surveys outslow. Its first orbits will be high and leisurely, and the craft will take daysto loop around Vesta at altitudes of about 1,700 miles (2,735 km). After taking pictures and gathering data fromup high, Dawn will spiral down to lower and lower orbits, eventually settlingin a little more than 100 miles (nearly 161 km) high ? lower than satellitesorbiting Earth. The great Vesta view Dawn gets won't berestricted to astronomers: Researchers will quickly combine the images theprobe captures into a movie, allowing the mission team and public all tovicariously ride along. After a year orbiting Vesta, Dawn will moveon to take a look at the asteroid belt's largest body: the dwarf planet Ceres. Dawn's mission follows on the heels ofseveral others, as astronomers have become increasingly interested lately innear-Earth objects. For example, the European Space Agency'sRosetta spacecraft just beamed back pictures of Lutetia, which at 62 miles(100 km) wide is the largest asteroid yet visited by a spacecraft. And in June, the Japanese space agency'sHayabusa probe returned to Earth after a seven-year journey to the asteroidItokawa. Hayabusa's goal was to return samples of an asteroid to Earth, whichwould be a first ? and it may have done so, though the jury is still out.